In one of his last official acts, President Obama will welcome President-elect Donald Trump and his wife, Melania, to the White House this morning. The Obamas will welcome the Trumps to the White House at around 9:30 a.m. ET (8:30 a.m. CT). The Trumps and the Obamas will then ride together to the Capital for the inauguration. The meeting carries on a longstanding tradition for sitting presidents inviting their successors to the White House on inauguration day. The inauguration will begin at 11:30 a.m. ET with the swearing-in happening just before noon. While Trump is assuming his new duties, the Obamas are reportedly headed to a vacation in Palm Springs. After their vacation, they will move into a rented mansion in Washington's Kalorama neighborhood where they plan to stay for a few years to allow their 15-year-old daughter, Sasha, to graduate from high school. Ivanka Trump, Donald Trump's eldest daughter, and her family, will be moving into the same neighborhood. Trump's wife, Melania, said she will remain mostly in New York while the couple's young son, Barron, age 10, finishes out the school term. 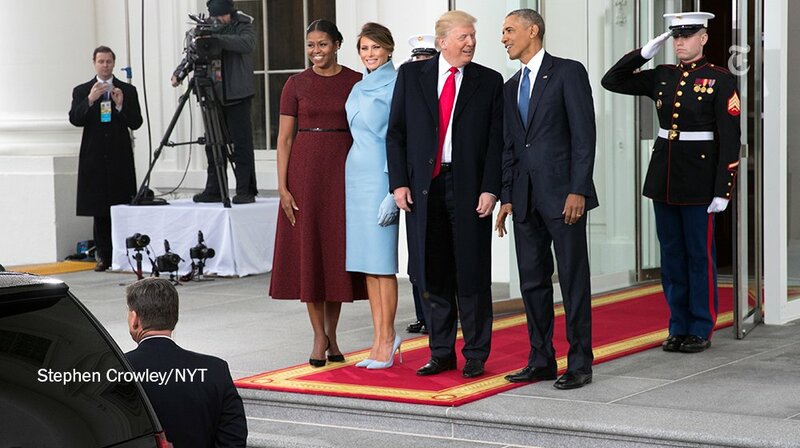 Trump and Obama met at the White House shortly after the businessman's surprise victory over Democratic challenger Hillary Clinton in what the President-elect described as a beneficial meeting.